Lovely Villa, Inspiring Views, private,peaceful,Quinta do Lago,Beach and Lake. A beautiful and spacious villa enjoying a delightfully secluded 0.5 acre plot bordering the Quinta do Lago South Golf Course 6th fairway. Quinta do Lago is the most exclusive golf and beach development in Portugal and rivals any resort in the world. 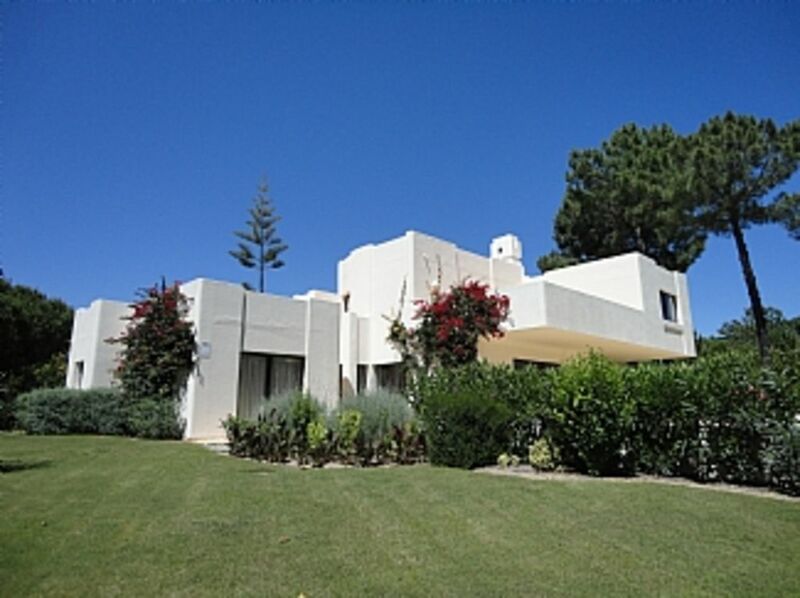 It consists of 4 golf courses, salt water lake, bird sanctuary and a wonderful natural sandy beach (no buildings), golf, tennis, riding, sailing,windsurfing , water activities for children are on the doorstep, great shopping at the entrance to Quinta do Lago and a tremendous choice of really good restaurants ,cafe/bars plus top class night club. (discount golf fees are available). 3 bathrooms (2 en-suite) + 1 cloakroom. Fully fitted kitchen with all appliances including microwave and dishwasher, two fridge freezers, ceramic hob, electric oven. Directly on the 6th fairway of the Quinta do Lago south course. Tennis, riding, water sports, sailing, swimming,fishing, bird watching all within the Quinta do Lago Estate.Great walks around the lake along the beaches and the migratory bird estuary with wonderful interesting bird species. Amazing stay . The house is larger than the pictures appear and the pool is a good size and warm when heated. The garden provided a great space for the kids to run around and you felt like there was not any other people around at all! It was quiet , tranquil and relaxing but close to the shopping centre and restaurants . Very easy to get to from the airport , taking just 25 minutes . We felt this was great value for money given the area and was perfect for a family holiday. The owner David was super helpful in advance which we appreciated- thank you. For us, hiring a holiday villa through Owners Direct was a 'leap of faith' since we had never done it before. Having established contact with the owner, we were immediately reassured. The administration, key collection and other necessary instructions were all really clear - along with the kind recommendations for 'what to do and where to go locally' which was a great help. The villa is located in a stunning and secluded spot, set amongst some of the most exceptional real estate in the Algarve. A dream 'home from home' really - everything you need for a very comfortable and enjoyable stay - we could not have asked for more. An outstanding area, a lovely residence and all within easy reach of shops, restaurants and having the ocean nearby (and the welcome Atlantic breeze in the afternoons) as well as the salt water lake where there is lots to do including sailing, wind surfing and fishing - that's the icing on the cake! Highly recommended and an outstanding place to stay - we will be back. Nature reserve with lovely walks, migratory bird reserve,horse riding, sailing, water sports, tennis, golf,fishing. There is a great sandy natural beach no buildings and in addition a large sea water lake with its own beach and water sports ideal for children.Fun water park,Go-karting near by. Large sailing lake and magnificent sandy beach within one kilometer.Great walks. Faro airport is 20 minutes. Top quality shopping mall and restaurants 500 at the entrance to Quinta do Lago. Almancil 4 kilometers. Loule, Quartiera, Faro, Almancil markets.Vilamoura Marina all within 15/20 mins drive. Many excellent restaurants to enjoy around the estate and nearby,delightful shopping facilities at the entrance to Quinta do Lago.